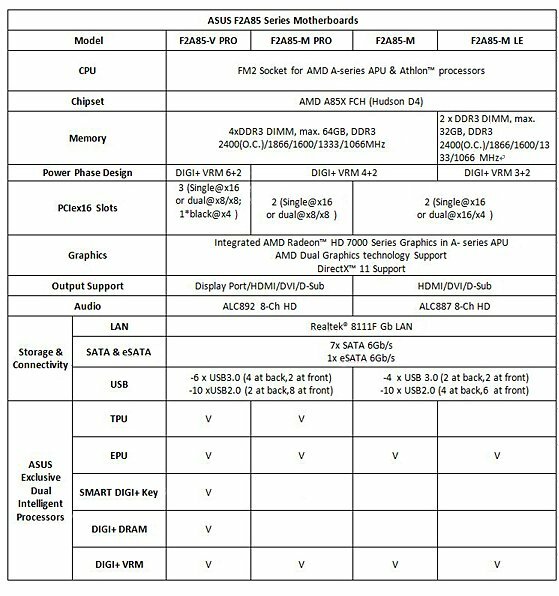 With the launch of AMD's Trinity desktop APUs finally coming near, ASUS releases four F2A85 series motherboards. ASUS has announced their F2A85 Series motherboards based on the new AMD A85X chipset and FM2 socket, designed for AMD’s second generation Accelerated Processing Units (APU). The next generation APU offers superb performance to deliver users an upgraded gaming and multimedia experience. Embedded in the APU is an AMD Radeon™ HD 7000 Series GPU that drives superior performance-per-watt graphics, which is bolstered by support for AMD Eyefinity technology enabling an ultra-immersive visual environment on up to three independent display outputs. Users also have the option to add a discrete graphics card to enable the Dual Graphics feature, which provides users with even better graphics performance along with peace-of-mind future upgradability. 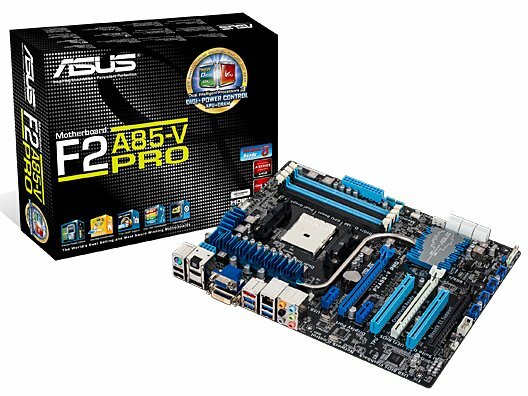 F2A85 Series motherboards come with a variety of ASUS-exclusive features to get users more out of their APU, including Dual Intelligent Processors 3 (DIP3) with new DIGI+ Power Controls to save up to 65% in system energy, GPU Boost to enhance integrated graphics up to 17%, a worry-free USB BIOS Flashback tool and Remote GO! to complement the multimedia experience. In addition to the ASUS exclusive features is a superior design built with high quality components. Examples include a more efficient and silent heat-pipe cooling design that provides better overclocking ability, along with Super Alloy Chokes that give the motherboard both a high current capability and low heat generation. Combined, they make the F2A85 Series motherboards the perfect platform for everything from HTPCs to mainstream PCs. New to ASUS APU-based motherboards is the ASUS-exclusive Dual Intelligent Processors 3, which brings users unprecedented levels of power control to the APU. The DIGI+ Power Controls offers increased system efficiency and stability through two digital voltage controllers that allow for ultra-precise tuning of APU and DRAM power delivery. Also part of DIP3 is the EPU, which offers up to 65% energy savings and the TPU, which offers one click auto tuning for an automatic system performance boost. Graphics performance is also bolstered by GPU Boost, which offers a simple way to boost the integrated GPU’s performance up to 17%. The innovative one stop software offers diverse and easy-to-use functions that are accessible through the UEFI BIOS and AI Suite II. F2A85 Series motherboards also feature the USB BIOS Flashback tool, which offers users the most convenient way to flash the BIOS. Users need only insert any USB storage device and push the dedicated USB BIOS Flashback button for three seconds, which then automatically flashes the BIOS. For extra convenience, users can use this function without the need to enter the BIOS or operating system, as well as being able to function without key components such as the APU and memory installed. ASUS also offers the new DirectKey feature, which is a dedicated button that when pushed, directly access the BIOS without the need to repeatedly press the Delete key. Once in the BIOS, users are greeted with the intuitive and user friendly UEFI BIOS for a total BIOS solution that further enhances the user experience. Remote GO! - Well-appreciated Functions from Wi-Fi GO! APUs are designed to deliver a better home entertainment experience. The Remote GO! function goes further, enhancing the multimedia to the next level by linking PCs, tablets, smartphones and TVs wirelessly together through an existing LAN cable and router setup. It allows users to stream multimedia content from PC to DLNA devices, access their computer anywhere using their mobile device at home, while also allowing easy file transfers between connected computers and mobile devices. It provides seamless multimedia environment for a futuristic connected lifestyle with three useful functions: DLNA Media Hub, Remote Desktop and File Transfer.